Contact Joanna at Field Cottage on 01544 340 241 or complete the enquiry form. 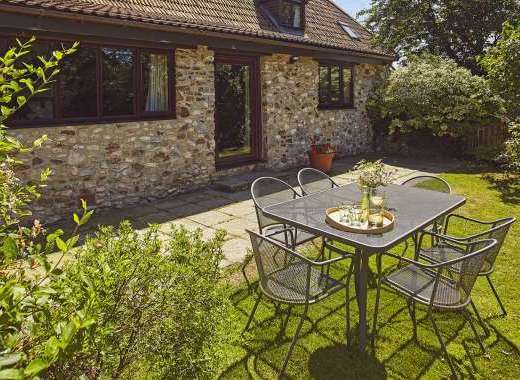 Field Cottage is a lovely high quality 2 bedroom holiday home which is situated next to a beautiful orchard on the Welsh border mid-way between Hay-on-Wye and Ludlow. 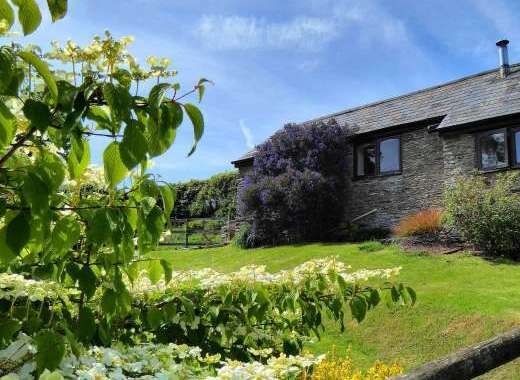 With a beautifully decorated interior, Field Cottage offers four star standard accommodation and features wonderful panoramic 360°views out towards the Black Mountains, Welsh Hills and Clee Hill, making this a very special holiday cottage. Within Field Cottage there is a large open plan sitting-room/dining room which leads out to a south facing terrace, a well equipped kitchen and cloakroom. Upstairs there are two bedrooms; one double and one twin along with a family bathroom. A z-bed is also available if required. 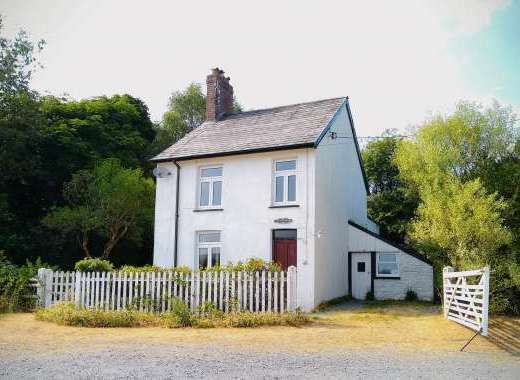 The property is centrally heated and features an open fire, TV, video, telephone, music centre, games and welcome hamper. This high quality cottage is dog-friendly and is furnished to a high standard, please note if you require an absolutely pristine appearance that this holiday home has a contemporary, shabby chic look with antique French furniture which does not necessarily mean smooth sliding drawers! This property is not suitable for very young children as the stairs are open, as can be seen in the additional photographs. Please visit the owner's website to find out more about the holiday cottage, amenities, surrounding area and places to visit in Herefordshire. 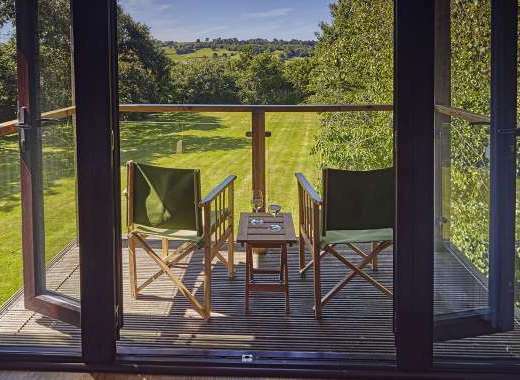 Field Cottage offers four star accommodation in a beautiful orchard setting, with panoramic countryside views of 360° through the Black Mountains, Welsh Hills and to Clee Hill. Antiques centres at Hay, Leominster, Kington, Ludlow. First Michelin star (The Stagg Inn, Titley) eating in Ludlow (15 miles) and Titley (2 miles), Within easy distance of Symonds Yat in the Wye Valley. Kington is a Border town with all amenities. With top quality butchers, to small supermarkets selling every day items, to small delis selling all local produce. We highly recommend Glyn Slade-Jones Butches on the main high street, as well as the Co-op for all your usual items, to The Grape Vine selling fresh fruit veg, and fresh fish delivered every morning. 12 Apr 19 26 Apr 19 £620.00 Friday Please Contact Owner/Agency for more info. 27 Apr 19 02 May 19 £595.00 Monday " "
03 May 19 06 May 19 £630.00 Friday " "
07 May 19 23 May 19 £630.00 Tuesday " "
24 May 19 31 May 19 £670.00 Friday " "
01 Jun 19 30 Jun 19 £630.00 Monday " "
01 Jul 19 18 Jul 19 £630.00 Monday " "
19 Jul 19 31 Aug 19 £670.00 Friday " "
02 Sep 19 17 Oct 19 £612.00 Monday " "
18 Oct 19 01 Nov 19 £635.00 Friday " "
02 Nov 19 19 Dec 19 £612.00 Monday " "
20 Dec 19 03 Jan 20 £824.00 Friday " "